Whatever you can say about the Ngorongoro Crater in Tanzania: it's the place to make some - close up - photos that were missing in your photo collection. A confined area; the animals - except some elephant bulls - never leave the crater. Vast plains with few trees. 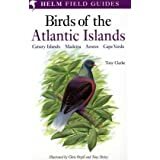 Good overview. But how wild is the Ngorongoro Crater? To make an analogy: comparing Selous Game Reserve (very wild) to Ngorongoro Crater is like comparing Ngorongoro Crater to your local Safari zoo or park (like the Dutch Safaripark Beekse Bergen). 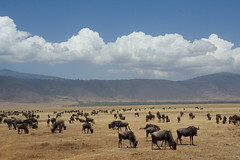 Ngorongoro Crater is close to a zoo. The animals are so used to the queues of 4x4 vehicles that they are not scared anymore. Hyena's at 2 meter from the road. A wildebeest lying on the road and not moving away... The closest I got with a 4x4 from any wildebeests in Selous Game Reserve was maybe 40 to 60 meters. They ran off at that point. Here it was just 2 meters. Also, in Selous there is a different subspecies of wildebeest; the Nyassaland Wildebeest or Johnston's Wildebeest. Nevertheless, the big herds make great pictures. 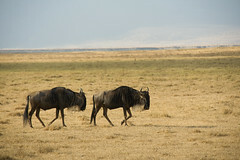 The Western White-bearded Wildebeest of Ngorongoro is the same subspecies that is renown from the Great Migration in the Serengeti - Maasai Mara ecosystem. 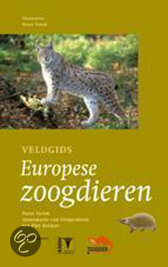 And for the Dutchies: Gnoe is the proper Dutch word, secondary it's Wildebeest. The English call it Wildebeest and occasionally Gnu. So we're talking about the Westelijke Witbaardgnoe here. 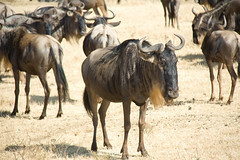 What you see in Maasai Mara with the Great Migration is what is happening in Ngorongoro as well: trains of wildebeests. They prefer to walk in line, behind each other. On fixed trails. What sometimes may look like car tracks on the grass on some photos, is actually the wildebeest trail. Cars can't go offroad in Ngorongoro. 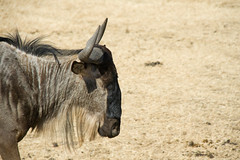 Just have a look at my photos of Western White-bearded Wildebeests in Ngorongoro Crater if you want to see more. Enough about poetry, on with photography. The crater rim, blue skies, sunshine and a docile herd of wildebeests make great pictures, but does not give you the true 'wild' and safari feeling. If you like that, go to Selous Game Reserve for an off road and wild adventure. But don't expect to be approaching any wildlife as close as in Ngorongoro Crater.